Before presenting additional rules relating to necromancers in my Dwimmermount campaign, I want to make a couple of points. As I originally conceived the necromancers of Yethlyreom, they are a lot more focused on corporeal undead than on incorporeal types. Part of this is practicality: corporeal undead can be created more easily by means of magic and a good part of what the necromancers do is impress the dead into service as soldiers on behalf of civilization against Chaos (more below). This is why the necromancer's special abilities don't include things like summoning or communing with the dead (though they possess spells in their arsenal that do just that). Perhaps the name "necromancer" isn't the best one, but I couldn't think of another and, after decades of misuse, even a pedant like myself has to bow to the reality that the word now simply means "wizard who specializes in dead things." My second point is that, despite how they go about it, the necromancers of Dwimmermount are not, by and large, Chaotic in alignment. As you may recall, "Lawful" in my campaign merely means "supporting civilization against Chaos." It does not necessarily mean you're a nice guy or that your methods of supporting civilization are pleasant ones. The church of Typhon, for example, is a rock-ribbed supporter of civilization and one of its most ardent defenders, but it is Lawful (Evil), because it sees nothing wrong with the strong lording it over the weak. So, necromancers can't be Lawful (Good), owing to their practices, but they can definitely be Lawful or Lawful (Evil). A few, no doubt, slip over into Chaos, but they'd be considered apostates even among their own kind, in addition to being enemies of civilization. Becoming a Necromancer: A magic-user who wishes to practice necromancy must either begin play as an apprentice (1st level) necromancer or seek out a necromancer of at least 10th level to teach him its secrets. After a month's basic training, such a magic-user is now considered a necromancer and may take full advantage of its benefits -- and likewise suffers from all its drawbacks. A magic-user may choose to abandon the practice of necromancy, but cleansing himself of its taint takes time. A period of one month per level is required, during which time the magic-user may neither use any necromancer abilities or specialty spells. During this cleansing period, the magic-user still suffers all the penalties associated with necromancy and may, if he so wishes, call on the unique powers of the class he is abandoning. Doing so, of course, ends the cleansing period, which must be begun anew should the character again decide to renounce the Black Art. Alignment: A necromancer may be of any alignment except Lawful (Good). A Lawful (Good) magic-user who chooses to become a necromancer must change his alignment, suffering whatever penalties (if any) the referee exacts on characters who do so. Charisma Penalties: The study of necromancy suffuses the practitioner with unwholesome energies that repel and disgust other living creatures. A necromancer's Charisma score is thus treated as two steps lower than it actually is on the Charisma Table for the purposes of determining reaction adjustment, the number of retainers, and their morale. Effective Charisma cannot drop below 3, however. Clerical Abjuration: Necromancy is proscribed by all the gods of Men. Consequently, a necromancer -- including a penitent one during his cleansing period -- cannot receive any benefit from clerical spells, whether they be healing spells, bonuses to attack rolls or saving throws, or even magically created food and water. Clerics may associate with necromancers on a limited, mission-specific basis, but they are otherwise shunned by them. Spells: As noted previously, necromancers have full access to the magic-user spell list. In addition, they may also learn the 3rd-level clerical spell speak with dead as if it were a magic-user spell of the same level. There are also a number of unique necromancer spells that will be described in Part III. Peter Cushing makes necromancy look cool. Very intriguing. I'm trying to work up a necromancer class for my campaign. I'm thinking that it will be more along the lines of a ritualistic caster than a spell slinger in the tradition of D&D Vancian Magic. I'm looking towards Palladium Fantasy and Stormbringer to help develop alternative ritual magic systems to use. It's always great to see other people's take on the subject. I bring it up because, from context, one would expect the Clerics to do the shunning but, as the subject of the earlier phrase, this seems to make them the shunee. I would suggest using an alternative such as "but they usually shun one another" or "but otherwise shun them"... depending on intent. Also, apologies for playing back-seat editor. I hate that guy. Clerical abjuration brings up an interesting question. As I recall, you only come up with your gods as needed, but does this section imply that there is no "god of the dead?" Or does it mean that there is one, but he's implacably hostile to necromancy? If the latter, that would leave an intriguing opening for an order of "hunters of the undead" in that deity's service. People seem to have the worst time with that one particular contraction. I just saw an ad in a magazine with a huge headline that misused "it's" instead of the more proper "its": "California fresh food at it's finest." What's sad is that someone didn't know the correct way to spell it, but even worse is that (most likely) someone else look it over during the editing phase and didn't catch the mistake. And then they paid thousands of dollars to run the ad in a magazine. Sigh. Regarding the necromancer class, I really like your idea of simply swapping out spell "slots" for necromancer-flavored powers. It's a very simple, elegant solution to something that could have otherwise become very bloated and rules-heavy. Even thought I don't play OD&D/LL like you do, the concept can be applied to pretty much any version of D&D or its knock-offs. I hang my mouse in typo shame. Anthony... so far the closest we have is The Iron God, who is indeed implacably opposed to undead. 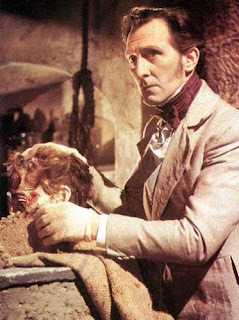 Peter Cushing makes anything look cool. Since your necromancers act on the dead rather than gaining knowledge from (or about) them, perhaps they should be called "necropraxers." "Perhaps the name "necromancer" isn't the best one, but I couldn't think of another"
How about "thanatosophist" or something similar? Perhaps it is abusive but I think I like it. I'd definitely stick with the term Necromancer. It carries with it such lush imagery that I fear just wouldn't come across with another word. That said, I have mixed feelings about the necromancer class you've built. I fully support the desire to make a necromancer class that is more unique than the standard wizard. That said, it seems a bit weak and the hindrances seem severe (most notably being unable to benefit from clerical healing). Perhaps I should wait for part 3 to see the unique Necromancy spells you've made but I'd suggest adding some sort of undead servitor in addition to the animate dead spell feature. Or perhaps adding a regenerative ability to offset the lack of clerical healing. Just my thoughts, I look forward to read Part 3. Yes, perhaps instead of attracting followers, the necromancer can have undead servitors, as Patrick suggests. Not being able to be magically healed is a pretty big disadvantage (at least as soon as clerics reach level 2, and assuming that other quick healing isn't available). Do the necromancers have their own healing? Allows the caster to bind small bits of dead tissue to a wound, healing 1d6 damage.